The new Fixturlaser NXA Pro laser shaft alignment system features multiple industry-first innovations including new sensors, a new display touchscreen, a re-engineered power management system, new reporting, the addition of MEMS Inertial Motion Sensors (gyroscopes) in both sensors and in the display unit, as well as new software featuring OmniView — all in the service of increased performance and greater ease of use. 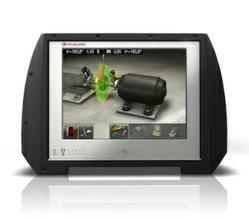 A MEMS (microelectromechanical systems) gyroscope in the display unit powers the new OmniView function. With OmniView, the screen display changes in real time to always show the machine being aligned from the same viewing angle as seen by the operator, i.e., the system logs the user’s position and keeps track of it in relation to the machine. No other laser alignment system can do this. The new sensors use a 2nd generation scientific grade CCD technology with 'best-in-class' accuracy as well as increased reliability. Resolution of the 30 millimeter vertical sensors is equivalent to the vertical resolution of ultra high-definition television. Updated algorithms improve the sensors’ performance for linearity, sidespot and dirt rejection, and ambient light filtration. Power management has been completely redesigned for the new NXA Pro to provide the industry’s best operating times while using 40% less power. The system operates, under continuous use, for up to 10 hours between charges. (The sensors can continuously measure for 17 hours without charging.) Also included is an advanced 1-hour ‘quick-charge’ feature. The Fixturlaser NXA Pro continues to support the Verti-Zontal Compound Move® alignment method. This innovative alignment process created by VibrAlign allows for the vertical and horizontal adjustments to be made together in one pass, saving valuable time and ensuring accuracy the first time around. Where older alignment techniques would require a machinery maintenance pro to make multiple adjustments and take multiple measurements, Verti-Zontal alignments are often completed with just one set of adjustments.